Eremurus has its origins in Iran, Turkey and Afghanistan, the dry grasslands and semi-desert regions of Asia. Eremurus is found in a range of colors like yellow, orange, cream and sandy-pink. They were first discovered and cultivated in the mountainous regions of central and western Asia. They are also known as foxtail lilies, giant asphodel and desert candles. These common names are found to be more popular than the botanical name Eremurus. These names portray the shape and color of flower and the similarity of the foliage to the thick, bushy tails of animals. They also carry these names as an depiction of the kinds of environments they grow best in. Eremurus is a graceful flowering plant available from the end of spring(early summer) to the throughout of summer. The bulb holds spikes which are as tall as 8 foot. A lot of star shaped flowers are arranged along the spike. The spikes are totally covered with beautiful flowers. Flowers are observed to be found in a wide array of colors like pink, orange, yellow, cream and salmon. 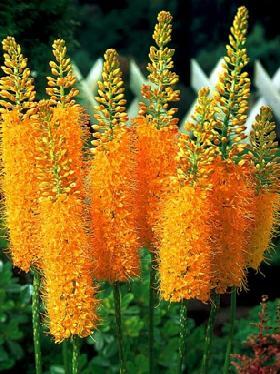 The species of plant named foxtail lily has its name as the shape of the flower stalk is similar to that of a fox’s tail. The plant bears a long spike around which clusters of flowers bloom forming a shape similar to that of a feather. The leaves are slender and form a low foliage which is an advantage to the looks of the plant as the spikes are seen naked and thus prettier. These flowers are ideal in parts of the world where winters are cold and springs are warm. They are also widely grown in places where summer is dry. They suit best in temperate and cold climate areas. 1) Eremurus Himalaicus: This is the hardiest and most popular of all species under the genus Eremurus. This plant has its origins the temperate Himalayas and Afghanistan. These plants have large white flowers with flower clusters as long as 36 inches . They are usually 6 feet tall but can grow upto 8 feet tall. The flowers are similar in shape to stars and also give a sweet odor. These plants favor mild winters. They prefer sunlight and bloom best when kept in a spot where sunlight falls throughout the day. They require well drained soil for optimim growth. 2) Eremurus Robustus: The Eremurus robustus is known to be the star of any garden. One can not ignore the Eremurus. They stand out tallest in the garden and impress the gardener by the dramatic shape of the flower. These plants may be as high as 10 feet tall. The flowers are soft blue and the flower cluster itself may be over 35inches tall. A flower cluster contains of almost 750 flowers which flower in June. It has an impressive foliage. The leaves are blue-green in color. These flowers flower for a short period of time, like few weeks but for this transient phase they can be worth it. These plants are hardy, and can be forced. 3) Eremurus Bungei: This species has mediocre height, they are usually 4 feet tall. They have their origins in the country called Persia. Flowers are yellow in color and they start blooming in June. The spikes of this flower are wand like but not very long in comparison to other species of the same genus. The most popular varities of this species are E. B. pallidus and E. B. superbus. Both of these varieties bear yellow flowers and are small, usually have a height of 2-3 foot. They are mostly found in Afghanistan and Kurdistan. Seeds: The perfect time to sow seeds is in the autumn season as in this season the seeds are ripe. They can be sown in pots or trays. The germination of theses seeds is rather a time consuming process. They usually take 1-12 months to germinate if the temperature of the place is about 15 degree Celsius. The seedlings should be taken out of the pots when they are big enough to grow on their initial winter. They should be planted in their stable position after arrival of the last frost. They should not be planted deeply in the soil and one should make sure that crown of the plant should is considerably exposed. Division should be done when their crowns grow out of the soil. The plants should be divided only once in every six years. Cultivation: Eremurus needs an extremely well drained soil of average pH for effective growth. The drainage of the soil can be maintained by adding some sand or peat moss if the drainage is initially low. Eremurus can not thrive in soil with more than normal moisture, especially that kind of soil in which water is logged. They also flower best in locations where sun light falls throughout the day. Thus these plants should be located in places where there is maximum sunlight. The roots should be planted 6 inches deep. The gap between two consecutive roots should be about a foot. The root should be gently watered after the plantation. If rain fall happens to be taking place during the growing season, there is no need to water the plants regularly during the growing season. If there is no rain, the plant should be watered regularly. The flowers spikes can be cut off and kept in vases. This will not damage or deteriorate the well being of the plant in any way so the spikes can be cut freely. As soon as the blooming for the season ends, the slower stems can be pinched off the flower. The foliage can be left as it is. As the season changes and cold arrives, the foliage slowly weaken and get dry. The flowers will automatically grow in the same spot the next year. These flowers are not good candidates for indoor growth in pots, tubs and vases. They prefer to remain in the outside, undisturbed and thus they are not the right choice for indoor growth. They are best looking when planted in borders and beds. The flower is immune to any pests or diseases but not insects. They should be saved from harm by snails and slugs. Uses: Not all species of flowering plants belonging to the Eremurus are known to have uses. However, a flowering plant named Eremurus spectabilis is known to be useful. The root of this precious plant is known to contain a chemical which has the property of being sticky. It is known to have a high percentage of gum in its root and thus is used to make glues of very high class. The bulb is also used in may other activities. The root of this plant is dried and used for sizing cloth and bookbinding.